Learn how to navigate the shared governance process. Download our 2018 Report Card on how our CA schools are doing with Tobacco-Free policies. Search our policy database and find out where your school ranks. Learn how to roll out your new policy using announcements, signage and social media. Download helpful handouts, graphics and videos that can aid in spreading your message. Assistance with educational and punitive enforcements through handouts and trainings. Utilize student, staff, and faculty volunteers as Policy Ambassadors! Free, in-person trainings. Like traffic school, Compliance Training videos outline the essential elements of the rules to people who have violated the policy. Earth Day serves as a unique opportunity for tobacco prevention advocates to educate their campus communities on tobacco-related issues apart from the well-known health information. Every phase of tobacco (growth, production, and consumption) is harmful to the environment and very few people are aware of the extent of the destruction. Registration now open! Apply now to serve on the COUGH (Campuses Organized and United for Good Health) Student Leadership Board for the 2019-2020 term. Build leadership skills and be part of a statewide movement to make positive change. Learn how to effectively communicate for change and receive in-depth training on tobacco, public health, and policy advocacy. Community college students are especially encouraged to apply. Application deadline is April 26th. We are pleased to announce the release of the 2018 Smoke/Tobacco-Free College Report Card. 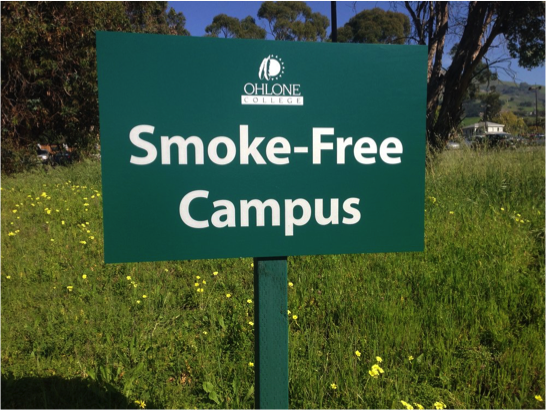 Findings conclude that while all four-year universities in the state are smoke and tobacco-free, only 46% of community colleges are. Use this report to convince your campus administration that now is the time to make a change!